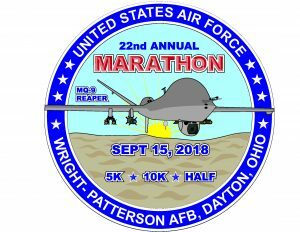 The 2018 Air Force Marathon wasa held on September 15, 2018 and features the MQ-9 Reaper. The Reaper is a is an armed, multi-mission, medium-altitude, long-endurance remotely piloted aircraft that is employed primarily against dynamic execution targets and secondarily as an intelligence collection asset. 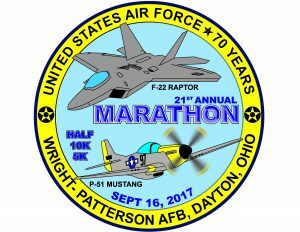 The 2017 Air Force Marathon was held on September 16, 2017 and featured two aircraft, the F-22 Raptor and the P-51 Mustang. The F-22 Raptor is the Air Force’s newest fighter aircraft while the P-51 Mustang is a long-range, single-seat fighter and fighter-bomber used during World War II and the Korean War, among other conflicts. 2017 also marked the 70th anniversary of the United States Air Force. 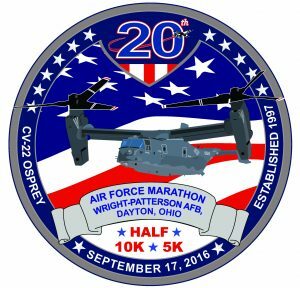 The 2016 Air Force Marathon was held on September 17, 2016 and featured the CV-22 Osprey. The CV-22 Osprey is a tiltrotor aircraft that combines the vertical takeoff, hover and vertical landing qualities of a helicopter with the long-range, fuel efficiency and speed characteristics of a turboprop aircraft. Its mission is to conduct long-range infiltration, exfiltration and resupply missions for special operations forces. 2016 was also the 20th Air Force Marathon. 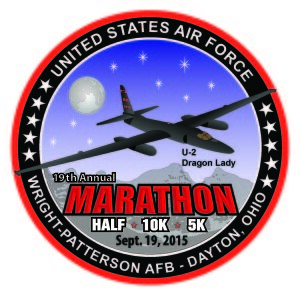 The 2015 Air Force Marathon was held on September 19, 2015 and featured the U-2 Dragon Lady. The U-2S is a single-seat, single-engine, high-altitude/near space reconnaissance and surveillance aircraft providing signals, imagery, and electronic measurements and signature intelligence, or MASINT. Long and narrow wings give the U-2 glider-like characteristics and allow it to quickly lift heavy sensor payloads to unmatched altitudes, keeping them there for extended periods of time. In 2013, the Air Force Marathon was held on September 21 and featured the C-130J Super Hercules. The remarkable C-130 first entered service in 1956 and the J model is the latest addition to the fleet. Compared to old models, the J model climbs faster and higher, flies farther at a higher cruise speed, and takes off and lands in a shorter distance. In 2012, the Air Force Marathon was held on September 15 and featured the B-2 Spirit. The B-2 Spirit is a multi-role bomber capable of delivering both conventional and nuclear munitions. It represents a dramamtic leap forward in technology and is a major milestone in the U.S. Bomber modernization program. In 2011, the Air Force Marathon was held on September 17 and featured theB-1B Lancer. The B-1 bomber is the backbone of America’s long-range bomber force, providing massive and rapid delivery of precision and non-precision weapons against any potential adversary, anywhere around the globe on short-notice. In 2010, the Air Force Marathon was held on Saturday, September 18th and featured the B-52. For more than 40 years the B-52 Stratofortresses have been the backbone of the manned strategic bomber force for the United States. The 2009 the Air Force Marathon was held on Saturday, September 19th. To commemorate our rich history in flight, each year one aircraft is chosen to be highlighted during the marathon and on the unique finisher’s medal presented to each race participant. In 2009, the Air Force Marathon featured the RQ-4 Global Hawk unmanned aircraft system. The 2008 Air Force Marathon was held on Saturday, September 20. To commemorate our rich history in flight, each year one aircraft is chosen to be highlighted during the marathon and on the unique finisher’s medal presented to each race participant. In 2008, the Air Force Marathon featured the F-22 Raptorfighter. The 2007 Air Force Marathon was held on Saturday, September 15. To commemorate our rich history in flight, each year one aircraft is chosen to be highlighted during the marathon and on the unique finisher’s medal presented to each race participant. In 2007, the Air Force Marathon featured the C-5 Galaxystrategic airlift plane. 2007 also marked the United States Air Force’s 60th anniversary. The 2006 Air Force Marathon was held on Saturday, September 16. To commemorate our rich history in flight, each year one aircraft is chosen to be highlighted during the marathon and on the unique finisher’s medal presented to each race participant. In 2006, the Air Force Marathon featured the A-10 Thunderbolt II close air support plane. 2006 marked the 25th anniversary of the A-10’s initial deployment. The 2006 logo depicts the shark-faced plane characteristic of the Flying Tigers, 23rd Fighter Group, Pope Air Force Base, North Carolina. The paint job is unique to the 23rdFG and is a nod to the Flying Tigers’ World War II heritage. The 2005 Air Force Marathon was held Saturday, September 17. To commemorate our rich history in flight, each year one aircraft is chosen to be highlighted during the marathon and on the unique finisher’s medal presented to each race participant. In 2005, the Marathon featured the U-2 Dragon Lady high-altitude reconnaisance and surveillance aircraft. 2005 marked the 50th anniversary of the U-2. The 2004 Air Force Marathon was held on Saturday, September 18. To commemorate our rich history in flight, each year one aircraft is chosen to be highlighted during the marathon and on the unique finisher’s medal presented to each race participant. In 2004, the Air Force Marathon featured the F-117A Nighthawk low-observable precision-strike stealth plane. The 2003 Air Force Marathon was held on Saturday, September 20. To commemorate our rich history in flight, each year one aircraft is chosen to be highlighted during the marathon and on the unique finisher’s medal presented to each race participant. In 2003, the Air Force Marathon featured the The B-2 Spirit, a multi-role bomber capable of delivering both conventional and nuclear munitions. The 2002 Air Force Marathon was held on Saturday, September 21. To commemorate our rich history in flight, each year one aircraft is chosen to be highlighted during the marathon and on the unique finisher’s medal presented to each race participant. In 2002, the Air Force Marathon featured the F-15E Strike Eagle dual-role (air-to-air and air-to-ground combat) long-range fighter plane. The “E” model is a variant of the F-15 Eagle, which carries solely air-to-air combat responsibility. 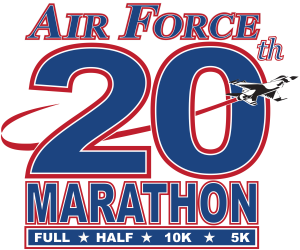 The 2001 Air Force Marathon was originally scheduled to be held on Saturday, September 22. To commemorate our rich history in flight, each year one aircraft is chosen to be highlighted during the marathon and on the unique finisher’s medal presented to each race participant. In 2001, the Air Force Marathon was to feature the B-1B Lancer multi-mission, long-range bomber plane. The race was cancelled in remembrance of those who lost their lives on September 11, 2001. The 2000 Air Force Marathon was held on Saturday, September 16. To commemorate our rich history in flight, each year one aircraft is chosen to be highlighted during the marathon and on the unique finisher’s medal presented to each race participant. In 2000, the Air Force Marathon featured the F-16 Fighting Falcon, an air-to-air combat and air-to-surface attack fighter aircraft. The 1999 Air Force Marathon was held on Saturday, September 18. To commemorate our rich history in flight, each year one aircraft is chosen to be highlighted during the marathon and on the unique finisher’s medal presented to each race participant. In 1999, the Air Force Marathon featured the C-17 Globemaster III tactical airlift and airdrop cargo plane. The 1998 Air Force Marathon was held on Saturday, September 19. To commemorate our rich history in flight, each year one aircraft is chosen to be highlighted during the marathon and on the unique finisher’s medal presented to each race participant. In 1998, the Air Force Marathon featured the F-22 Raptorfighter. The inaugural Air Force Marathon was held on Saturday, September 20, 1997. To commemorate our rich history in flight, each year one aircraft is chosen to be highlighted during the marathon and on the unique finisher’s medal presented to each race participant. In 1997, the Air Force Marathon featured the Wright 1909 Military Flyer, the original military aircraft. The Wright Flyer was conceived and built by Dayton’s own Wilbur and Orville Wright, for which Wright-Patterson Air Force Base is partly named.